Synopsis (from the publisher): Barcelona, 1957. It is Christmas, and Daniel Sempere and his wife, Bea, have much to celebrate. They have a beautiful new baby son named Julian, and their close friend Fermin Romero de Torres is about to be wed. But their joy is eclipsed when a mysterious stranger visits the Sempere bookshop and threatens to divulge a terrible secret that has been buried for two decades in the city's dark past. 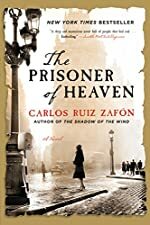 His appearance plunges Fermin and Daniel into a dangerous adventure that will take them back to the 1940s and the early days of Franco's dictatorship. The terrifying events of that time launch them on a search for the truth that will put into peril everything they love and ultimately transform their lives.